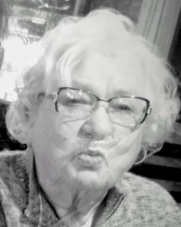 RoseMarie Iverson, 87 years young, passed away on March 15, 2019, at inpatient hospice at Kalispell Regional Medical Center. She went to the arms of her dear savior, Jesus Christ. She was born to Ralph and Ruth (Kjelstrup) Jager on July 11, 1931, in Whitefish. Her dad worked for H. Earl Klack and the family finally settled in Great Falls where RoseMarie grew up and graduated from high school. She then went on to complete a two-year music scholarship in Moscow, Idaho, where she played her beloved violin and graduated with a teaching certificate. She started teaching first grade in Conrad in 1952. She went on a blind date in early 1953 and met her soul mate, Robert Iverson. They married Oct. 3, 1953, and moved to the Iverson Ranch in Ledger to start their life together. As their children grew and became school age, RoseMarie opened a kindergarten class for all rural children within a 5-mile radius of the farm. RoseMarie continued to be active in her church and the community of Ledger, even playing for the Great Falls symphony as the second chair violinist during the early years of their marriage. She and Robert provided a rich environment for all their children, grandchildren and friends throughout their life, enjoying everything to the fullest with much laughter and love. She moved eight years ago to the Flathead Valley to live with Renee. She was fortunate enough to have Jean Lightner living in Village Greens and spent many years making new Rummy friends with a lot of laughter and mostly losing at cards. Rick would be the maitre d', keeping the coffee flowing with sweet treats. She is preceded in death by her loving husband Robert Iverson (2009), her parents Ruth (1972) and Ralph Jager (1976), and her brother Bobby (1945). She is survived by four children Ron (Connie) of Ledger, Renee of Kalispell, Rick of Missoula and Rhonda of Ledger; six grandchildren Joren (Nancy), Kirsten (Kyle), Aaron, Chris, Kelsey and Kyle (Mina); seven great-grandchildren Hunter, Abby, Jakob (parents are Joren and Nancy), Lauren, Layne, Kade (parents are Kirsten and Kyle) and Rose (parents are Kyle and Mina). She leaves behind her beloved four-legged animals — Sugar, Maddy and Bailey. A celebration of her life will be held June 8 at the Pondera Valley Lutheran Church in Conrad with the time to be announced. In lieu of flowers, we ask that you simply make a donation to a charity of your choice. RoseMarie will be greatly missed, but she will always be remembered in our hearts!